This article is about the area generally found above the main floor or floors of a house. For other uses, see Attic (disambiguation). Space or room below a pitched roof of house or other building. Attic bedroom in Skóga, Iceland. 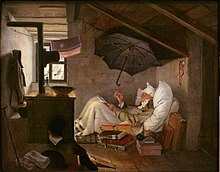 An attic (sometimes referred to as a loft) is a space found directly below the pitched roof of a house or other building; an attic may also be called a sky parlor or a garret. Because attics fill the space between the ceiling of the top floor of a building and the slanted roof, they are known for being awkwardly shaped spaces with exposed rafters and difficult-to-reach corners. While some attics are converted into bedrooms, home offices, or attic apartments complete with windows and staircases, most remain difficult to access (and are usually entered using a loft hatch and ladder). Attics are generally used for storage, though they can also help control temperatures in a house by providing a large mass of slowly moving air. The hot air rising from the lower floors of a building is often retained in attics, further compounding their reputation as inhospitable environments. However, in recent years attics have been insulated to help decrease heating costs, since, on average, uninsulated attics account for 15 percent of the total energy loss in average houses. A loft is also the uppermost space in a building but is distinguished from an attic in that an attic typically constitutes an entire floor of the building, while a loft covers only a few rooms, leaving one or more sides open to the lower floor. The word "attic" is derived from the Attica region of Greece and comes from Attic style architecture. The term referred to "a low decorative facade above the main story of a building" and, as used in the phrase "attic order", had originally indicated a small decorative column above a building's main facade. Louvered attic vent in a gable. Modern building codes permit both vented and unvented attics in all climates, if a building is otherwise correctly constructed. However, unoccupied attics should usually be ventilated to reduce the accumulation of heat and moisture that contribute to mold growth and decay of wood rafters and ceiling joists. In cold climates ventilation also helps to prevent ice-dams on the roof and leaks that they cause. In hot climates, ventilation reduces cooling loads. Sometimes an insulated roof with an internal vapor barrier is preferable to a ventilated attic. In areas with wildfire hazards, sparks can enter attic vents, so houses are safer without vents. Areas with wind-driven rain, fog or sea-spray might also prefer houses with insulated roofs instead of vents. A habitable attic, or a habitable room without an attic may use an insulated roof so that moist air from the habitable area cannot condense on the roofing materials. Also, a building with a complex roof or many piercings between the conditioned area and the attic might control condensation better or more cheaply with an insulated roof and a vapor barrier. One common code requirement is that the total area of attic vents be equal to or greater than 1/150 of the floor area of the attic, with 50 percent or more of the vent area located in the upper portion of the attic. Vents and louvers should face away from prevailing winds to keep out driven rain. Soffit vents under the eaves normally provide the low vents. 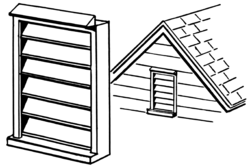 Louvered vents in gables can provide the high vents in small houses or short gables. If a ridge is open, some metal roofing systems can install ridge vents along the entire ridge line of the roof. Various types of turbine ventilators and exhaust fans can assist with attic ventilation and decrease the required area of passive ventilators. ^ Kilborne, Sarah S. (2012). American Phoenix: The Remarkable Story of William Skinner, A Man Who Turned Disaster Into Destiny. New York: Simon and Schuster. p. 146. ISBN 978-1-4516-7179-7. ^ Skeat, Walter W. (1993). The Concise Dictionary of English Etymology. Hertfordshire, UK: Wordsworth Editions. p. 22. ISBN 978-1-85326-311-8. ^ a b c "BSD-102, Understanding Attic Ventilation". Building Science Corporation. Retrieved 26 December 2018. ^ International Code Council (2015). 2015 International Building Code Illustrated Handbook. New York: McGraw-Hill Education. pp. 506 (Section 1203.2). ISBN 978-1-259-58613-2. ^ "How to install a metal roof ridge cap". American Building Components. Retrieved 26 December 2018. This page was last edited on 26 December 2018, at 14:10 (UTC).